Music enthusiasts across the UK are preparing for the biggest (and smallest) festivals of the summer. With bags packed and wellies at the ready, it certainly feels like summer is in full swing. Insurance and finances may be the furthest thing from your mind in the run-up to a festival, but failing to take adequate precautions could leave you hundreds (or even thousands) of pounds out of pocket. To ensure pick-pockets and opportunist tent-raiders don’t put a dampener on your festival experience, we’ve rounded up some of the most effective ways to keep you and your possessions safe this festival season. Should I leave valuables in my tent? 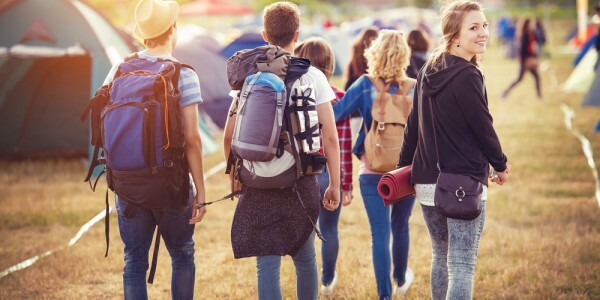 Before you head off, take an inventory of all the goods that could be at risk during the festival – will you be carrying a laptop, smartphone, tablet or camera? How much would it set you back to replace all these items if your tent were plundered? When packing your most valuable gadgets into your festival backpack, it could be worth exploring cheaper alternatives – for example, consider taking a disposable camera or purchasing a cheaper pay-as-you-go phone. It could also help to put a lock on your tent – although this may not make a difference to your insurance policy, it could act as a deterrent to wannabe criminals. Otherwise, you could secure your valuables in any lockers provided at the festival or come up with a system to share out valuable items within your group of revellers. When taking out your home insurance policy, your insurer will want to know if you need protection for your valuables while you’re away from your home. Glastonbury festival definitely counts as away from home! Remember, there is likely to be a single article limit on the amount you can claim for particularly expensive goods. Consider the specific value of your technical goods. Does it make sense to take out a dedicated policy for your gadgets? More and more people are taking their love of great music and camping with friends a step further by booking tickets to some of the world’s biggest festivals. If you’re lucky enough to have tickets to Benicassim or EXIT , it’s a good idea to make sure your travel insurance policy covers you. To make sure you’re covered, it might be worth considering personal possessions insurance which can protect your valuables against loss or damage while you’re away from home. Is my car insured if I take it to a festival? If you’re driving to a festival (or any major event), try not to leave out any objects that could attract thieves on display in your car. Some festival organisers advise music-lovers to leave glove compartments open to alert criminals to the fact there is nothing of value in the vehicle. Remember, it’s always easier to make a claim if you’ve been as careful as possible with your possessions. You should also make sure your car is festival ready before setting off - you'll have plenty to take with you but can you fit in there too? Having a tipple is part of the festival experience – and there’s nothing wrong with having fun – but try to do so as safely as possible. Keep an eye on your drink as even a moment of negligence could put you at serious risk. If you’ve been drinking excessively, it’s much harder to keep track of your possessions. Losing your phone, wallet or favourite watch at a festival is no fun! When you’re away from the home, you may take items such as your passport, driving licence and bank cards. Remember, these items are some of the most attractive to a potential identity thief. Before going into any situation in which you are at an increased risk of theft such as a festival, it could be worth asking yourself which forms of ID you really need to take with you. Make the most of secure facilities: many festivals offer security areas where you can protect your valuables.